Low-elevation wetland Low-elevation wetlands like this Spartina marsh in Massachusetts' Plum Island Estuary are frequently flooded by tides that deposit sediment and cause the marsh to build up at a fast rate (approximately 5-10 millimeters per year). Photo by Matt Kirwan. High-elevation wetland High elevation wetlands are infrequently flooded by tides, receive little sediment, and rely on the accumulation of roots to build elevation at slow rates (approximately 2-3 millimeters per year). Photo by Matt Kirwan. Left to themselves, coastal wetlands can resist rapid levels of sea-level rise. But humans could be sabotaging some of their best defenses, according to a Nature review paper published Thursday from the Virginia Institute of Marine Science and the Smithsonian Environmental Research Center. The threat of disappearing coastlines has alerted many to the dangers of climate change. Wetlands in particular—with their ability to buffer coastal cities from floods and storms, and filter out pollution—offer protections that could be lost in the future. But, say co-authors Matt Kirwan and Patrick Megonigal, higher waters aren’t the key factor in wetland demise. Thanks to an intricate system of feedbacks, wetlands are remarkably good at building up their soils to outpace sea-level rise. The real issue, they say, is that human structures such as dams and seawalls are disrupting the natural mechanisms that have allowed coastal marshes to survive rising seas since at least the end of the last Ice Age. 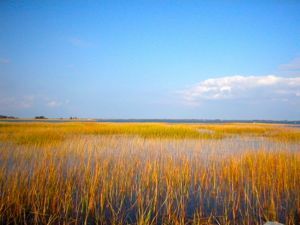 "Tidal marsh plants are amazing ecosystem engineers that can raise themselves upward if they remain healthy, and especially if there is sediment in the water,” says co-author Patrick Megonigal of the Smithsonian Environmental Research Center. “We know there are limits to this, and worry those limits are changing as people change the environment." "In a more natural world, we wouldn’t be worried about marshes surviving the rates of sea level rise we’re seeing today,” says Kirwan, the study’s lead author and a geologist at the Virginia Institute of Marine Science. “They would either build vertically at faster rates or else move inland to slightly higher elevations. But now we have to decide whether we’ll let them." Wetlands have developed several ways to build elevation to keep from drowning. Above ground, tidal flooding provides one of the biggest assists. When marshes flood during high tide, mineral sediment settles out of the water, adding new soil to the ground. It’s one of the more convenient response systems to today’s threat: When sea level rise accelerates and flooding occurs more often, marshes can react by building soil faster. Below ground, the growth and decay of plant roots adds organic matter—an effect rising carbon dioxide (CO2) seems to enhance. Even erosion can work in favor of wetlands, as sediment lost at one marsh can be deposited on another. While a particular wetland may lose ground, the total wetland area may remain unchanged. But everything has a threshold. If a wetland becomes so flooded that vegetation dies off, the positive feedback loops are lost. Similarly, if sediment delivery to a wetland is cut off, that wetland can no longer build soil to outpace rising seas. Direct human impacts, not rising seas or rising CO2, have the most power to alter those thresholds, the scientists report. Groundwater withdrawal and artificial drainage can cause the land to sink, as is happening right now in Chesapeake Bay. Because of this kind of subsidence, 8 of the world’s 20 largest coastal cities are experiencing relative sea-level rise greater than climate-change projections. Dams and reservoirs also prevent 20 percent of the global sediment load from reaching the coast. Marshes on the Yangtze River Delta survived relative sea-level rise of more than 50 mm per year since the 7th century C.E., until the building of more than 50,000 dams cut off their supply of sediment and sped up erosion. In addition to building vertically, marshes can also respond to sea-level rise by migrating landward. But, the authors note, human activities have hindered this response as well. Conventional ways of protecting coastal property, such dykes and seawalls, keep wetlands from moving inland and create a “shoreline squeeze,” Kirwan says. 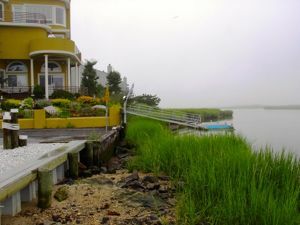 Because rates of marsh-edge erosion increase with rates of sea-level rise, the authors warn that the impacts of coastal barriers will accelerate with climate change.